Soak the preserved vegetables for 1 hour. Wash several times and drain. Cut the vegetables into 3cm length. Set aside. Boil a pot of water. Add rice wine. Parboil the pork belly for a few minutes and drain. Boil one bowl of water in a pot. Add the pork belly and simmer over low heat for 30 minutes. Drain and pat dry. 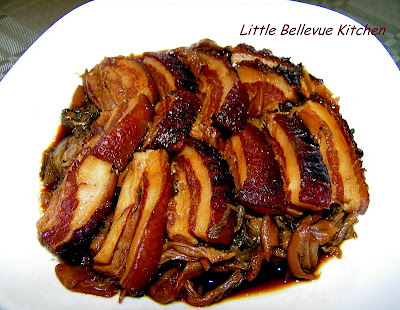 Marinate the pork belly with 1 tbsp soy sauce for 15 minutes or more. Set aside the stock for use later. Heat tsp oil in a pan. Fry the pork belly skin side down until browned. Remove from pan and when slightly cooled, slice into pieces about 1cm thick. Arrange the sliced pieces in a medium sized bowl, with the skin side down. Fry the dried vegetables till fragrant. Remove from wok and place them on top of the sliced pork belly. Heat up 1 tsp oil in a pan. Fry the ginger slices, garlic, green onion, star anise and cinnamon until aromatic. Add sauce to the pan and bring to a boil. Pour the sauce over the dried vegetables in the bowl. Place bowl in a steamer and use a plate to cover the bowl. Steam over medium heat for 45 minutes to 1 hour. Remove the plate. 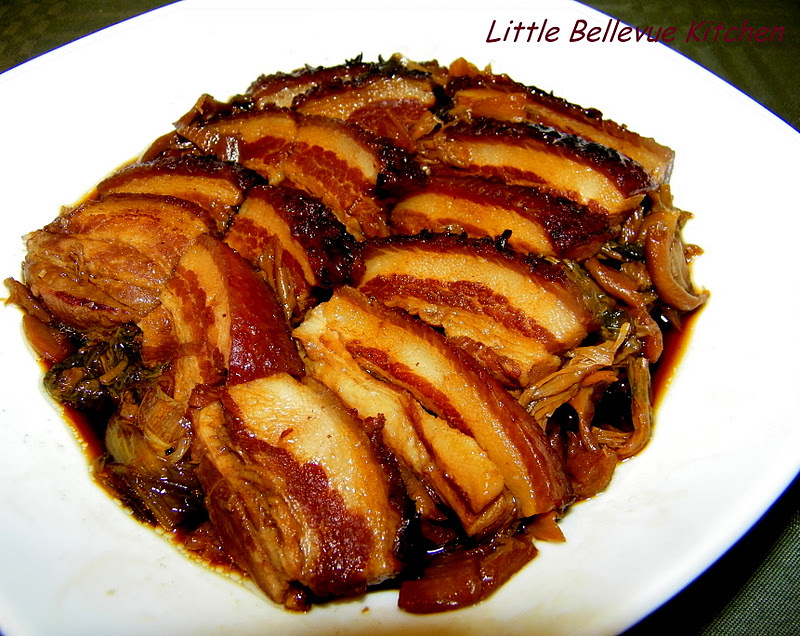 Invert the bowl of pork belly and dried vegetables onto a serving plate. 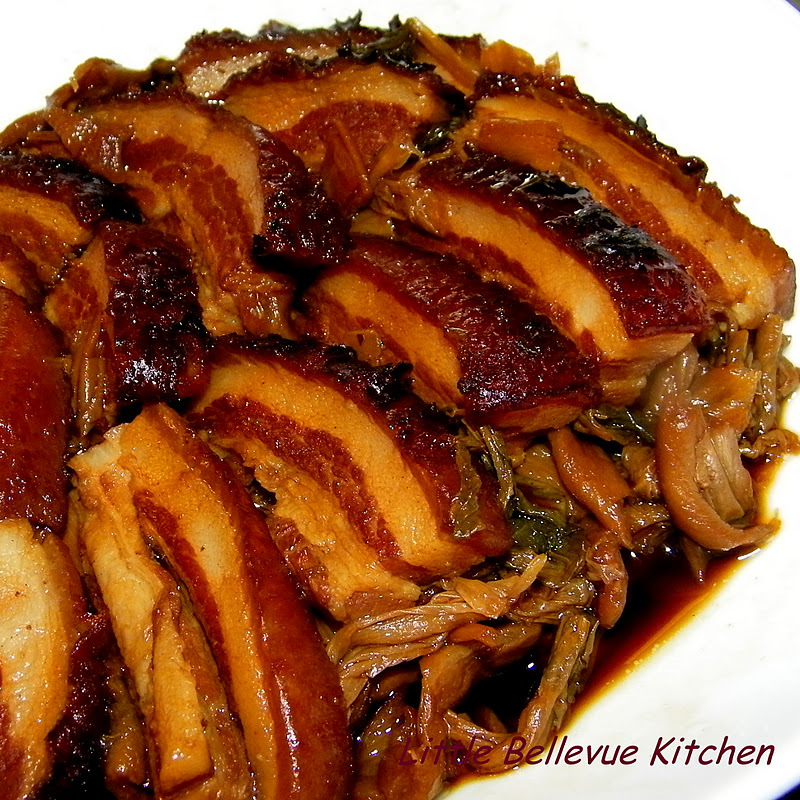 The pork belly should appear on top of the dried vegetables. Remove the ginger slices, garlic, star anise etc. Now pour the sauce over the dish and serve warm with rice. This is currently my favorite Chinese dish. It is a classic way of turning a sows ear into a silk purse. Only cooking can do this.